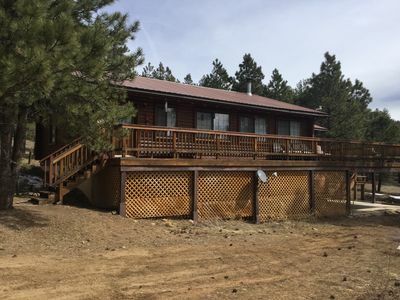 Nice 3B home with a TERRIFIC setting in the woods and surrounded by nature, but still only 2 1/2 miles from the slopes, one mile from the Country Club and one mile from Monte Verde lake. Take a look at the VIDEO I have now added to the VRBO listing. 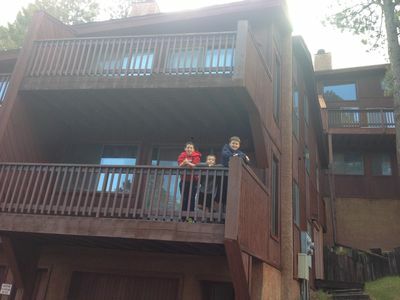 MAKE SURE AND CHECK OUT MY OTHER PROPERTY - MOUNTAIN VIEW CONDO(VRBO #46963). 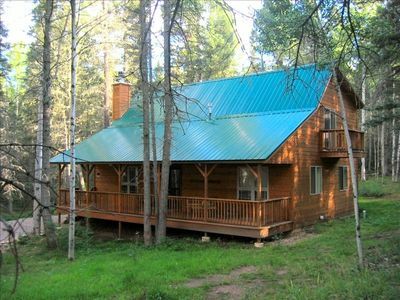 The Cabin is nestled in the woods and surrounded by nature, but still close to everything in Angel Fire and easily accessible year-round. Wifi is available at the Cabin in the Woods. See my personal website for details. New Queen mattresses and box springs in the the downstairs guest bedroom and master bedroom and also new living room furniture (there is no longer a hide-a-bed sofa in the living room). 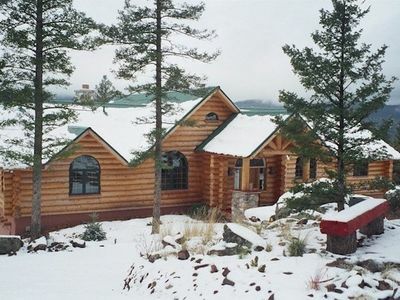 There is a covered porch across the entire front of the house, which is a great place to sit and enjoy the cool and refreshing mountain air. 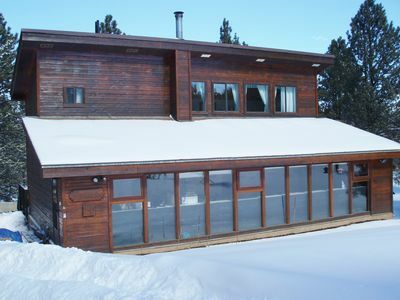 The home is located one mile from the golf clubhouse, one mile from the lake and 2 1/2 miles from the ski slopes or grocery store. 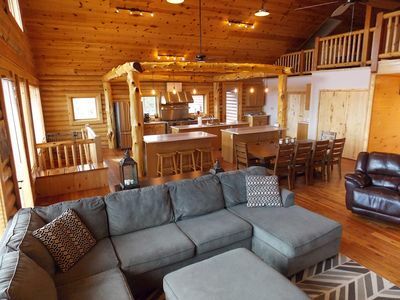 This New Mexico vacation rental is close to everything, but situated in the woods, where you feel like you have your own private place on the mountain. This three bedroom, two bath house that has beds for 12, but please limit your group to 10. The accommodations are great for two families, because there are separate bedrooms for both couples and then the kids can share the bunk bed room, which sleeps six. Visit my personal website (link below) for more details on the sleeping arrangements. 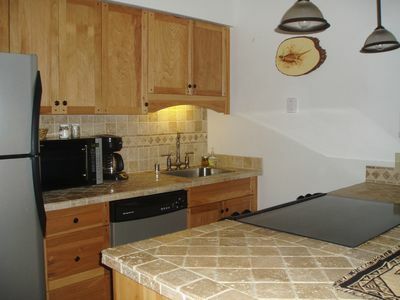 On the downstairs level, you will find the living area, kitchen, dining area, two bedrooms, and a full bath. 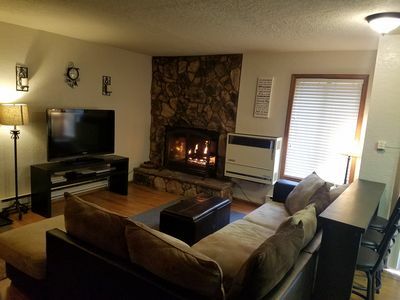 In the living room, there is a sofa (no longer a hide-a-bed sofa), loveseat, leather chair and a wood-burning fireplace. The entertainment center includes a 32 inch flat screen TV with DISH Network, DVD, and stereo system. A variety of DVD movies (over 30) are provided, but please feel free to bring your own. The kitchen is furnished with everything you will need and is open to the dining area that seats eight at the table, with a set of TV trays, also available for additional guests. There is also a gas BBQ grill outside (not accessible during the winter) if you would like to cook up some hamburgers or steaks. The front bedroom has a twin/twin bunk bed and a full/full bunk bed, that will sleep a total of six. In addition, there is a four drawer chest, a 20 inch TV with DISH Network and a Playstation 2 game system. There are about eight PS2 games provided. The rear bedroom, which has great views of the outdoors, has a queen bed (new mattress and box springs in July 2015), dresser and a 20 inch TV with satellite. Also downstairs is a bathroom and a full size washer and dryer. The master suite is located privately upstairs and is furnished with a queen bed (new mattress and box spring in July 2015), armoire, dresser with mirror, 20 inch TV with DISH Network, DVD player and a futon that sleeps two, just in case the younger kids would rather stay in the same room with mom and dad. Also upstairs is a full bath, large walk-in closet and a sliding glass door that leads to a private balcony off of the master suite. If you would like more information about the Cabin in the Woods or my other property, the Mountain View Condo (only a 3 minute walk to the slopes), click on the website link below for additional pictures, a detailed description of the furnishings, floor plans and a guestbook to see what others thought about their stay in these New Mexico vacation rentals. * Management company charges a $35 booking fee for each reservation. $500 deposit (down payment) at booking and balance is due 30 days prior to arrival. The Lift Condos Are The Closest Condos To Chilli Express Lift! 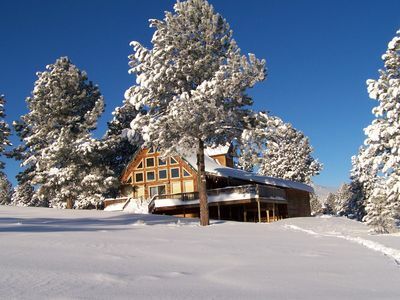 ENCHANTED CIRCLE LODGE-AWESOME MOUNTAIN VIEWS WITH A LOT OF ROOM TO PLAY!